The NPR-8 net pulse register is a simplified pulse totalizer designed to provide a totalized net pulse count from up to eight 2-Wire (Form A) input pulse sources. It is designed to work with an End-of-Interval (EOI) pulse input that coordinates and synchronizes the operation of the NPR-8. To simplify the operation of the NPR-8 all pulse values (weights) must be equal to each other, and are assigned a positive or negative sign for the pulse weight. Once an EOI pulse is received, the NPR-8 begins a new interval and counts positive and negative pulses in a count register. Each time a positive pulse is received on one of the designated positive inputs, the count register increments by 1. When a negative pulse is received, the count register decrements by 1 pulse count. At the end of the demand interval, the EOI input line receives a pulse, and the existing net count is transferred to the Output Register. Once the new interval is started, the normal count pulse counting operation resumes. While this is occurring, the Output Register begins outputting the number of pulses equal to the net count at a rate of 5 pulses per second, or a faster rate, if selected. These are generally fed into an electric meter pulse input, recorder, SCADA system or other telemetry device. If, at the end of a demand interval, the net count is zero or negative, no pulses are outputted to the external device. In this way, the “net” energy represented by the positive pulses minus the negative pulses is derived. Two Form A (K&Y) solid state isolated, dry-contact outputs are provided. Typical applications include renewable energy application with wind generation or PV solar electric systems requiring interfaces between utility metering devices, demand recorder applications, and supervisory control and data acquisition (SCADA) systems. The NPR-8 provides a sense voltage of +13 VDC to the eight K-Y pulse sending source contacts, normally eight meters, as well as to the EOI pulse input. 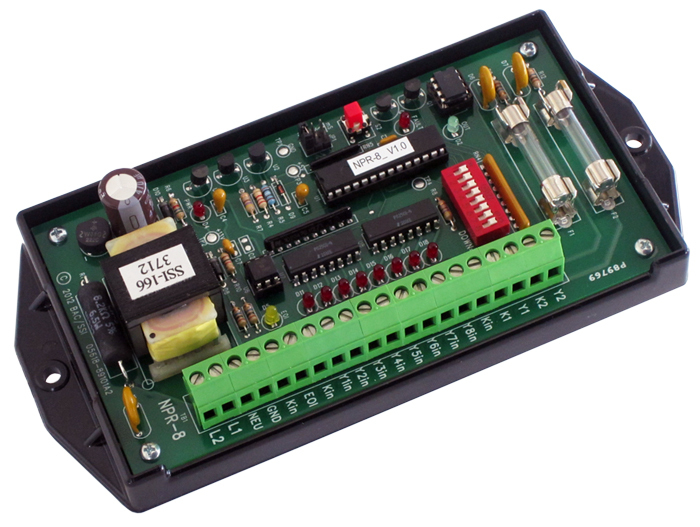 Each pulse input and the EOI input has a bright LED for system display. An output LED flashing to indicate the pulses being outputted to the external device. Installation and setup are amazingly simple. Programmable parameters are the pulse sign (positive or negative) and the output pulse width. Non-volatile EEPROM memory “remembers” the count and output register values in the event of power loss. Upon power-up, all register values are restored, so there is no loss of pulse counts or register values. The “K” lead of the NPR-8’s outputs are fused to prevent damage to the relay under almost any condition a user might cause such as excessive current, incorrect wiring, etc. The NPR-8 utilizes SSI’s standard built-in transient protection for the solid sate relay contacts that eliminates the need for external or off-the-board transient suppressors. All component parts of the NPR-8, which have power applied to them with the exception of the input/output terminal strip, are enclosed in a polycarbonate cover for maximum protection. The mounting base plate is also made of polycarbonate and offers excellent electrical insulation. Pulse Input: Eight 2-Wire Form A inputs. Two “Kin” input terminals are the common return for all meters. The “Yin” terminal is “pulled-up” to +13 VDC making it compatible with open-collector transistors, open-drain FETs or virtually any kind of KYZ switch (i.e. mechanical, electro-mechanical or solid state). Output Pulse Rate: The output pulse rate is selectable between 100mS, 67mS or 33mS with 100 being the default. Overflow LED: The Overflow LED indicates that the contents of the output register was too large for the output speed selected and was not able to output all of the contents of the output register before the next end of interval signal was received. This LED is resettable only by the reset function or cycling the power.